Gas Mixer [CUBEGM Series]｜FCON CO., LTD.
Manual type Gas Mixer [CUBEGM Series]／FCON CO., LTD.
● [CUBEGM Seires] is an all-in-one unit which have mass flow controller, control power supply, valve, check valve and gas mixer. ● Simply connect the piping to the IN side and OUT side. 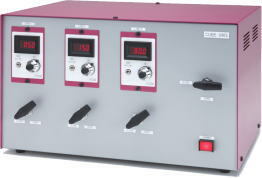 ● [CUBEGM Series] is a device which supplies a mixed gas species of 2, 3, 4 to set up and control to any of the flow rate. ● Analog mass flow controller [1000 Series] is mounted as a standard feature. ● Mass flow controller, which flow control range is from 10SCCM to 50SLM, can be mounted as a standard. In other cases, please contact us. ● Can be reduced the cost when you use a Gas mixer than you purchase gas cylinders that has been prepared in the mixing ratio. ● It can be used for a wide range of applications such as analysis, environment, bio, packaging, medical, gas welding. ◀ ［CUBEGM Series］ Catalog Download. Standard fitting 1/4in.SWL (equivalent) ※For other fitting, please contact us. ● May be changed items depend on the number of mass flow controller. The other specifications, please contact us.